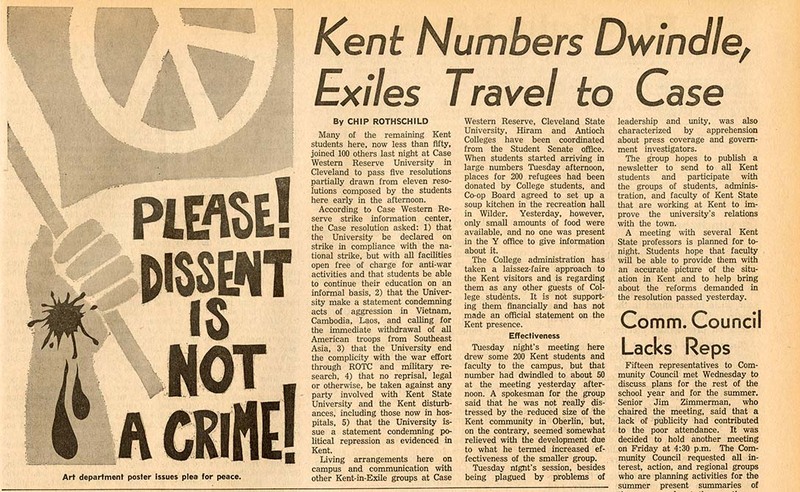 Article by Chip Rothschild, "Kent Numbers Dwindle, Exiles Travel to Case," in the Oberlin Review, May 14, 1970. 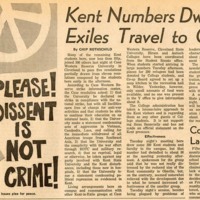 The article reports on the remaining Kent students at Oberlin, less than fifty, and their decision to go to Case Western Reserve University in Cleveland to continue organizing. The Kent students started arriving at Oberlin two days prior, and places for 200 "refugees" from Kent had been donated by Oberlin students, who must have doubled up in rooms. But the College did not officially support the Kent students financially and food was not provided, except for a soup kitchen set up by the Co-op Board. Oberlin Review, Vol. 98, No. 54, May 14, 1970 special edition, front page. Rothschild, Chip, “Oberlin Review article, May 14, 1970,” The Oberlin Sanctuary Project, accessed April 24, 2019, http://sanctuary.oberlincollegelibrary.org/items/show/102.